Proposition H of 2001 amended San Francisco's City Charter to create Section 9.107.8. 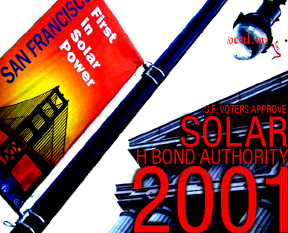 The H Bond Authority is an unlimited revenue bond authority for the San Francisco Board of Supervisors to issue revenue bonds to finance or refinance any renewable energy or conservation facility. Unlike Proposition B, the H Bond Authority may be used for private sector as well as government facilities, does not require that bonds be repaid from bill savings. Unlike Prop B, H Bonds are is not capped at $100 million. Issued to finance or refinance the acquisition, construction, installation, equipping, improvement or rehabilitation of equipment or facilities for renewable energy and energy conservation. For more information or to sign up for Local Power News, please visit Local Power. Copyright 2003 by Local Power.